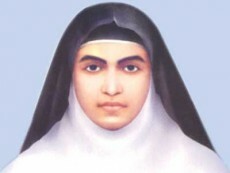 St. Alphonsa was born in the present day Kottayam District, Kerala, India as Annakkutty. She was raised by her maternal aunt, as Anna’s mother died when she was very young. Anna was well on her way of being educated, and at the age of 13 was badly burned. She fell into a pit of burning chaff, and burned her feet. The accident left her permanently disabled. As soon as it became possible, Anna joined the Franciscan Clarist Congregation. At the age of 17, she arrived at the Poor Clares Convent on Pentecost Sunday, and took the name Alphonsa. She made her final vows in 1936, the same year her foster mother died. She was educated in elementary education, and taught school. Often whe was too sick to teach. In December 1936, it is claimed that she was cured from her ailments through the intervention of Blessed Kuriakose Elias Chavara, but three years later was struck by a sever attack of pneumonia, which left her week. The following year a thief entered her room in the middle of the night and this event caused her to suffer amnesia, and again, weakened her. Her health continued to deteriorate over a period of the next few months. She received the extreme unction, and the next day it is believed she regained her memory, but not her health. Ultimately she worsened and died in 1946 at the age of 35. Her tomb in Bharananganam has become a pilgrimage site as miracles have and continue to be reported by the faithful. The actual miracle attributed to her intercession and approved by the Vatican for canonization was the healing of the club foot of an infant, in 1999. Pope Benedict XVI canonized her in October, 2008. She is the first person of Indian origin that was canonized a Saint by the Catholic Church. Saint Alphonsa had a lot of disappointment as a child, with the loss of her mother, being raised by her aunt and having a permanent disability with her feet. Life was not easy for her. Rather than drawing inward, and retreating from this world, she reached out towards God. She knew that by living out the Will of God, she could have an impact on those around her, and stay in union with God. Even through her sickness and death, she continues to reach out to intercede for others to this day. Being the first saint canonized by the Catholic Church of India origin, she is venerated today and miracles continue to be reported.